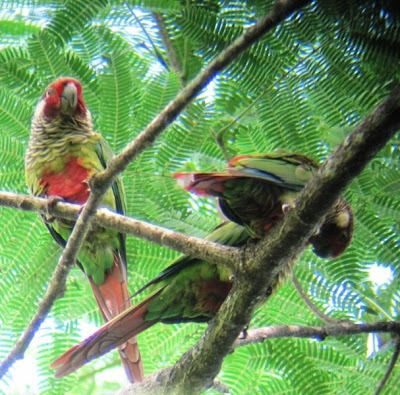 Last Saturday Gloriela Archbold, Jan Axel Cubilla, Rafael Luck and Venicio Wilson as guide, visited the farm of Juan and Fanny Velasquez in the town of Flores, Veraguas to find the endemic Azuero Parakeet (Pyrrhura eisenmanni). 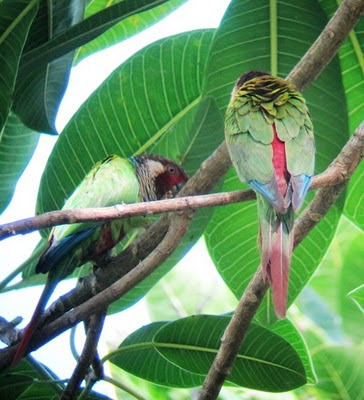 Juan and Fanny informed in my previous trip that the endemic parakeet visited their backyard during the months of May, June and July. According to Mr. Velasquez the Azuero Parakeets normally came to eat fruits from 8:30 to midday. On June 13 at 8:33 a flock of about 16 parakeets come to eat Figs at a tree next to the corn field in the Velasquez backyard. 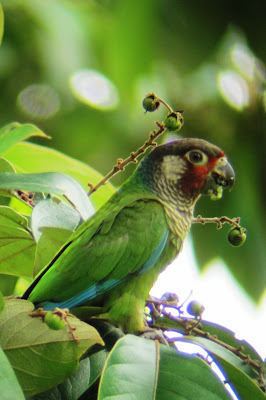 The birds ate figs and nance that were abundant in the gallery forest next to Playita River. 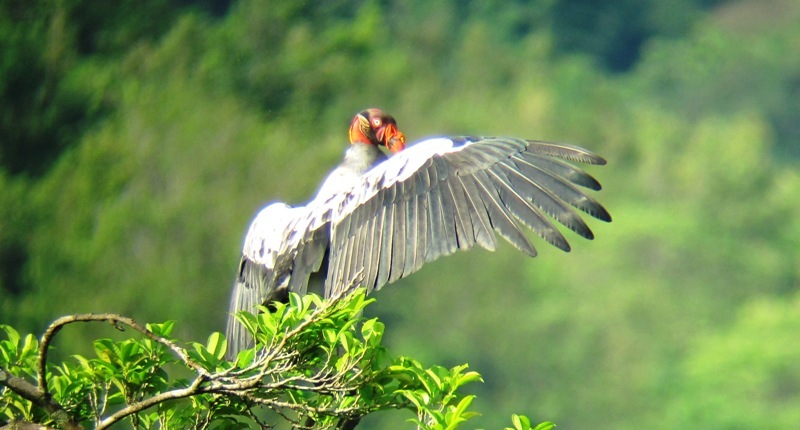 They moved from tree to tree and gave us a magnificent show. I saw at least one couple copulating, some grooming and some birds offering food to others. This could be an indication of the beginning of the breeding season? Here are some pictures and videos we managed to take with a point-and-shoot camera and a Kowa telescope. More pictures will be posted by Jan Axel Cubilla [here's his post on the subject] and Rafael Luck. In the pictures you could see how close we got to the flock of parakeets. As we drove out of the farm we spoted a small flock of 6 parakeets. Acording to Juan and Fanny's daugthers the small flock comes in the morning right next to the house.